Since Harry left on May 5th, life at Number 58 has not quite been the same. We have Lacey, our Retired Guide Dog and we’ve boarded a few pups over the summer, but Harry left a huge hole in our lives and we miss the goofy little man dreadfully. On the other hand we are so incredibly proud of him. I was reading another Puppy Walker’s blog recently and came across the following comment that someone had left. It just about sums up everything we feel about raising a Guide Dog pup:- Your heart will break, and you’ll wonder why you did this to yourself, but then one day you’ll see a dog out working and you’ll remember the real reason you’ve put yourself through this roller coaster ride. And then you’ll be able to be incredibly proud of your pup and the work you did with him, and THEN you’ll be all excited to get your next one and do it all over again. 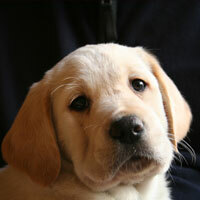 So, with that in mind, here’s a few photos of our first pup, Alfie that we’d like to share. Alfie came back to stay with us for a few days over the summer and he very kindly brought his Guide Dog Owner, his wife and her dog Simon. It was absolute privilege to have him back here with us, but to see him working in harness, well, it was unbelievable . We were just so, so proud of him. 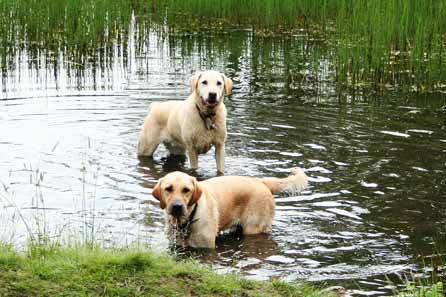 and an even better time playing around in the muddy water of the tarn. So, we’ve spent the summer getting to know our retired dog Lacey, having other pups to stay, and playing host to our first pup – now it’s time to move forward. And we are SO excited – a new pup will arrive at Number 58 tomorrow! We are busy madly puppy-proofing the house as we have become somewhat lax over the last couple of months, but it’s all being done with a smile and a huge sense of anticipation. The reality is that we just can’t wait! Following on from the previous post, we had a phone call early this morning from Harry’s trainer. She rang to tell us that Harry is moving on to Advanced Training TODAY. His advanced trainer will be ringing in a couple of weeks to give us more news. Watch this space! A week or so ago we had a telephone call from Harry’s trainer to update us on his progress. His training appears to be going really well, and we discussed couple of points in detail, one of which related to his motivation. The other related to Harry’s “spending” (or toilet habits). It seems that, although he was given the opportunity to “spend” before going out, he always managed to find a little something extra to deposit while out on a training walk. 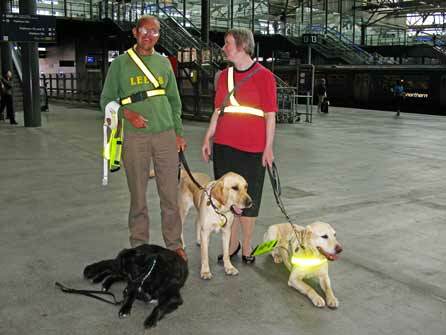 This is not the best of habits to have, a working Guide Dog should always be “clean” on a walk and this really needed to be sorted out. “Harry continues to progress with his training tasks. His motivation and willingness to take responsibility of the guiding role has improved. He enjoys regular routes with an incentive at the end, this has also helped increase his confidence and initiative levels throughout his training. I have established his spending routine and he has been consistently clean on his walks for a while now. You will be pleased to know Harry will be progressing onto advanced training. Harry’s “matching form” has been completed. 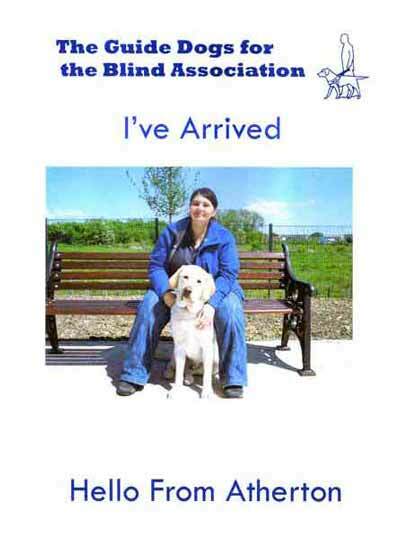 This is where all the attributes of the dog are listed and details circulated to all the District Teams around the country who have blind or visually impaired people waiting for the “right” dog. Once he has been selected by a District Team he will move to that area and undertake his Advanced Training. 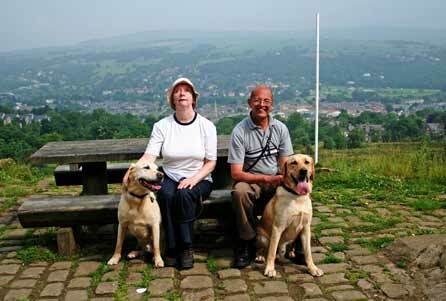 Matching the correct dog with the correct owner takes skill and experience. 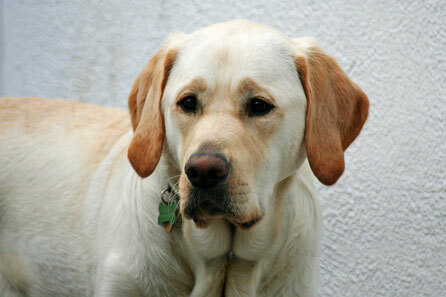 The owner’s length of stride, height and lifestyle all contribute to the type of guide dog they will be matched with. 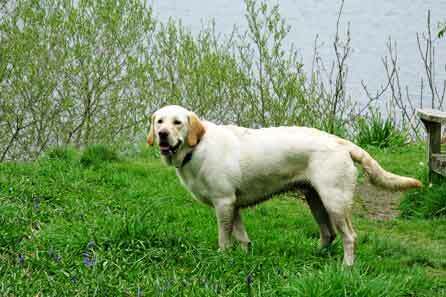 Harry will be the right dog for someone, but we just don’t know who that will be, or where they live. Now we just have to wait to find out which part of the country Harry will be going to, to do his Advanced Training and spend his working life. Harry’s trainer Lisa did telephone at the end of May to give us an update on his progress and it sounded like all was going well for him. He has settled in well to life at training school and he has become firm friends with his kennel mate, a long haired German Shepherd called Levi. They have a great time playing together in their kennel (which is really more of an indoor dog-run), and running around on the fields and in the sand-run areas. Harry and his trainer spent the first couple of weeks getting to know each other and developing a bond. When we spoke to Lisa he was just about to start his training in harness. This training involves learning to stop at kerbs and wait for the command to cross, not turning a corner unless told to do so, to move left or right to avoid obstacles, and to stop if there is not enough room for them both to comfortably get past. It also involves learning to find things like pedestrians crossings, steps and shops. Lisa also told us that Harry is a bit of a slouch, especially in the mornings, when he has to be prodded to get out of his basket. Can’t say that we were surprised by that bit of feedback – Harry always did like his bed! We always taught Harry to be a well mannered pup, and it seems he hasn’t forgotten. He has remembered to send us a card, which came in the post today. Card from Harry announcing "I've Arrived"
Harry’s trainer rang yesterday to give us an update on his progress. We were out and missed the call. The message on the answerphone didn’t give much away. Now we have to wait until next week. Arrrghh!! Harry’s last week with us was full of fun, although he still did his training walks, he had plenty of time to do all the things he loved to best and now he has moved on to the next stage of his career. 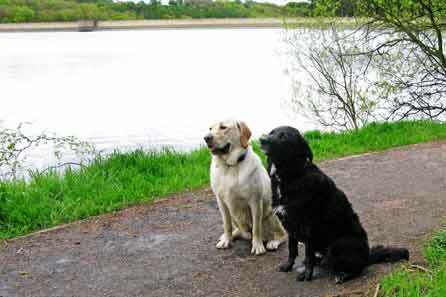 Harry was always meant to be one of the first pups to enter the new Guide Dog Training School at Atherton and was even invited to the ceremony to mark the laying of the Foundation Stone, so we were delighted that everything went according to plan and Harry was indeed included in the first group of dogs to go in. Harry’s supervisor was kind enough to take a couple of photos of his arrival for us. The lovely (and dedicated) kennel staff phoned us earlier today to tell us that, after his arrival yesterday, he has settled in well and already made lots of new friends – both the human and canine kind. At the moment he is staying in the “intake block” but will move on to his permanent kennel area in the next couple of days. It didn’t take him long to figure out that there’s definitely some perks to being there, apart from all the fuss and attention he’s getting, there is the added bonus of under floor heating. Harry immediately made himself quite at home and stretched out on the floor to advantage of such five star luxury. He always did like his creature comforts! 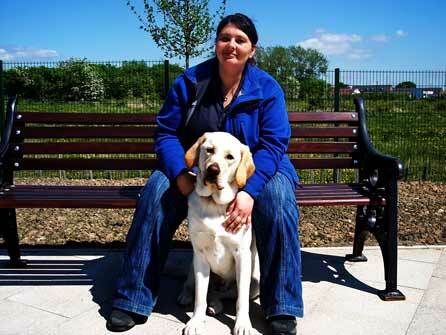 Harry will soon be meeting his new trainer and embarking on the next stage of his training. 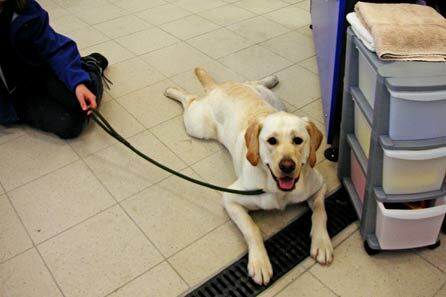 We’re sure he’ll do really well as he’s a gentle and sensitive little soul, but he’s also inquisitive, respectful, friendly, patient and independent, all of which should help him to make the transition to a fully qualified and working Guide Dog. As for us, we’re going to take a couple of months break, maybe do some decorating (not something that’s easy to do with a boisterous pup around), have a holiday and then we’ll embark on the whole adventure all over again with a new pup. Today is the day we’ve been dreading, the day Harry moves on to his formal training at the new Guide Dog Training Centre in Atherton. Puppy class was on this morning, but we played truant, preferring to spend the last few hours with him at home and on one last walk. Harry’s supervisor came to collect him about 30 minutes ago. He walked down the garden path without a backward glance. We know he will be well looked after and cared for, but it doesn’t make it any easier. Harry’s purpose in life is to be a loyal guide and companion to someone who needs him more than we do. We’ve done all we can, the rest is up to him. Today is Harry’s last full day here with us at Number 58, so we decided to take him on his favourite walk around a nearby reservoir. 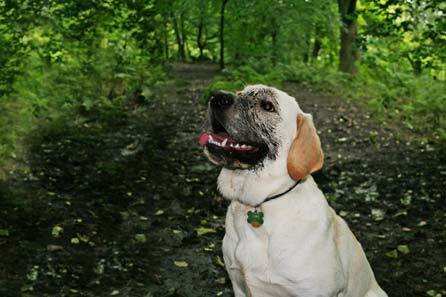 The walk is a long one and has everything a puppy could dream of – a patch of woodland to forage in, wide open spaces to run madly about in, water to paddle in and best of all, lots of muddy ditches. Harry loves this walk and he was keen to show Lacey ropes, he pointed out all the best spots and showed her where the best ditches were. 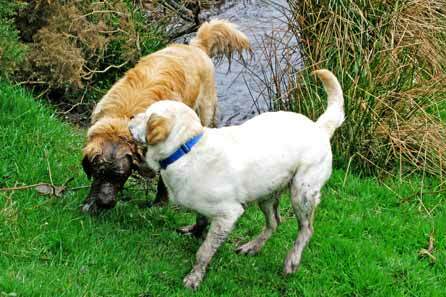 Funnily enough, by the end of the walk Harry was relatively clean and Lacey was dripping wet and filthy.